An organization’s future success depends on anticipating potential challenges and opportunities. A customized futures analysis of the forces impacting your workforce can help build a framework for change. We help you apply foresight tools to generate effective insight for sound, long-term workforce strategies. Deeper insights into current and future talent needs give you the time you need to prepare and ensure your organization has the right talent. Know how to anticipate your organization’s talent needs and to use futures insight to successfully frame targeted workforce plans and actions. Contact us at 202-270-0903 or jjarratt@leadingfuturists.biz to find out more. Program outcomes include a forward-looking assessment of the talent portfolio needed to drive future business strategies, which will inform and frame your strategic workforce planning process. 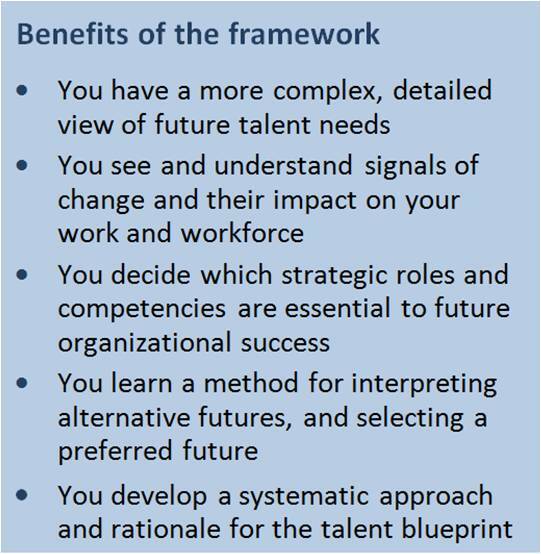 Who need a Futures Workforce Framework? HR executives, senior government managers, trade association members, all of whom know that workforce structures and changing and that their organization’s workforce future needs radical re-thinking. Contact us to plan your customized program: 202-271-0903 or jjarratt@leadingfuturists.biz. We focus on strengthening the foresight that organizations bring to leadership and strategy. Recent foresight workshops and programs include: “Maine 2050” for the state Bureau of Human Resources; aging workforce workshops for the U.S. Chamber of Commerce; workforce scenarios for Disney; futures exploration for the American Nurses Association. Since the 1980s, we have designed and led workshops and processes for organizations exploring workforce change. Jarratt and Mahaffie co-authored FutureWork, an exploration of the broad forces of change shaping work. Katherine Green is an expert in organizational development and leadership. We put our skills together to fine tune designs for programs that help organizations face the future, prepared. 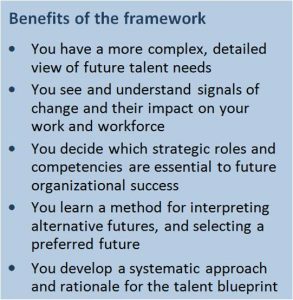 To download this page as a pdf, click here: Workforce Futures FRAMEWORK.